To perform the dental cleaning your pet will be put under anesthesia to prevent them from moving around and to allow the doctor to perform a full examination and cleaning. We make sure that your pet is comfortable and perfectly safe during the entire process. While your pet is under, the doctor examines the mouth, gums, tongue, cheeks, and teeth. This can reveal any cases of lesions, gum disease, tooth decay, or other problems. We will perform full mouth digital dental radiographs. These radiographs provide our veterinarians with valuable information about your pet's dental health by allowing us to see below the gum line and identify any abnormalities that may otherwise be undetectable. When these are discovered, they can usually be handled during the treatment. After examining the mouth the doctor will complete a full cleaning of the teeth and polish them thoroughly to give your pet a healthy, attractive set of teeth. Our skilled surgical technician will review each radiograph with you upon discharge from our hospital, in addition to providing you with detailed instructions on home care after the dental. 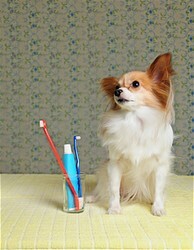 Call us today to schedule a dental cleaning for your pet.